A CNN poll released this week found that 63 percent of Americans think House GOP leaders were wrong to invite Benjamin Netanyahu to address Congress without notifying President Obama. Eighty one percent of Democratic respondents agree. This is AMAZING. So many Americans saw through the veil of secrecy and lies of our media to be pissed off at AIPAC. The vast majority of Democrats are angry but only a small handful of Democratic Congress puppets are pissed off. Public disapproval of the circumstances surrounding the Netanyahu speech, however, doesn’t appear to be a very powerful motivator for Democrats in Congress. Amazing! The fake liberal Jews running the Democratic Party don’t care one hoot what the voters think or want. They simply ignore all of us. Jews who are this blatant are walking straight into catastrophe. This is highly dangerous, extremely dangerous. History is crystal clear about the dangers but the Holocaust story leaves out Jewish actions causing the blow up over banking that led to Hitler gaining great power. Some House Democrats have circulated a letter calling on House Speaker John Boehner to delay the speech, on the grounds that it represents a partisan effort by Republicans to enlist the help of a foreign leader in scuttling one of the President’s chief foreign policy goals, i.e., reaching a nuclear deal with Iran, which Netanyahu bitterly opposes. This is an incredible story. It has zero analysis but does have admissions that Jews who run the Democratic Party are now totally out of touch with Democratic voters and there is zero mention of AIPAC in the story, of course, this being a conspiracy between the media owners and Congress to hide this rank, open sewer of corruption. Wow. Talk about ‘analysis’! This is of course, a total lie. Anyone with half a brain knows that the US and EU conspired, after the last Bilderberg meeting, to overthrow the government of Ukraine. Money and agents were concentrated in Kiev and the government was threatened that if they suppressed violent demonstrations, the President of Ukraine would be arrested and charged with ‘killing protestors’. More utter rot and insanity. They were warned again and again for the last 20 years. Anyone with a brain reading history knows that anyone who pokes Russia in the nose and moves towards Russia’s borders will end up in a world war like Napoleon and destroyed. It comes as European Council president Donald Tusk called PM David Cameron to discuss how the EU should respond to ongoing violence in eastern Ukraine. The Germans who were the last invaders of Russia have thrown in the towel. They are demanding the UK and US stop. The US wants WWIII because Congress is owned by the fascists in Israel. So the UK pretends to be this helpless leaf in the gutter rushing down the sewer. HAHAHA. The coup in Kiev was supposed to be handled in such a way as to keep any fingerprints hidden but this failed. Everyone knows the CIA, Mossad and the UK secret agents were all James Bonding in Kiev and they funded the coup and they collaborated with the snipers who were all Nazis, real honest to god Nazis, who were pretending to be government agents of Ukraine when they were actually working with foreign powers to overthrow the government. Gads. London teems with Russians. If they can’t analyze anything why not hire me? This is a stupid excuse. It is no excuse. HAHAHA. The entire EU had no ‘Russian experts’ except for an army of former Russian Jews. Who said, ‘We can overthrow Putin and replace him with Jewish guys who will loot the country’. Russia isn’t a perfect democracy. But the US and UK certainly are not a democracy AT ALL. Note the top story: the leaders of both parties in both countries totally ignore their own supporters whenever it comes to something Israel wants. And Israel’s Jewish leaders want to destroy Russia. And have endless wars with a billion Muslims. Anti-revolution West won’t lift sanctions if deal is reached: Leader of Iran claims. Yes, Iran has sanctions, Cuba has sanctions, Russia has sanctions and none of these are going into the hands of the Bilderberg gang so far. French Leader Urges End to Sanctions Against Russia Over Ukraine but the clueless gang running the US and UK won’t let that happen. See, they have no analysts who understand Russia and are helpless little piggies. The US report is based on official figures exchanged between the two countries as part of the New START disarmament treaty, and includes missiles deployed before September 1. The numbers show a significant increase from March, when data showed that Washington had a capacity of 1,585 payloads, and Moscow 1,512. The current figures are in violation of the New START treaty, signed in 2010 by Barack Obama and then-President Dmitry Medvedev, during the short-lived reset in relations between the two states, which prescribe a limit of 1,550 deployed warheads. Russia is ‘in violation’ because they noticed the US ceased disarming so they stopped but the US has more warheads still which is in total violation of the treaty. On the other hand, China is not going to let the US destroy Russia in WWIII so the scales tip in Russia’s favor. ‘Putin is watching us’: Senior MPs warn Cameron the military cannot cope with further defence cuts after RAF Typhoons are scrambled to intercept Russian bombers | Daily Mail Online: Russia is flying in international airspace as are many NATO jets right next to Russia. The British rulers claim the Russians were in ‘areas of interest’ but not LEGALLY OWNED by Britain. Video from ‘Russian Bear’ bomber captures NATO escorts over English Channel: NATO has been buzzing Russia for the last decade and is quite aggressive about this but when Russia does the same, the clueless elites who have no analysts howl with rage and they can’t figure out that they are provoking this response from Russia. The Russian Defense Ministry’s TV channel has released video footage taken from a Tu-95 strategic bomber as it was shadowed by RAF Fighter Typhoon jets. The video features engines that appear to be stalling. Heck, all of Eastern Europe is understandably ‘areas of interest’ for Russia and why are so many US and UK planes and military infiltrating all over that space? Rory Stewart of the Commons Defence Select Committee has called for military spending to be protected. Russian president Vladimir Putin will try to ‘humiliate’ Nato if the West goes soft on him, a senior MP has warned. What? This makes no sense at all. If the West ‘goes soft’ and stops attacking Putin and transgressing on his territory, Putin will be nice to the West in return. Rory Stewart, the influential chair of the Commons defence select committee, said the world was facing a ‘genuinely dangerous’ situation in Eastern Europe and warned there was a risk of unintended escalation. More insanity! Duh! We move towards Russia and expand NATO to Russia’s borders after lying about doing this, of course, this is ESCALATION and it is totally due to NATO and the EU leaders doing things that are openly hostile. He said the threat posed by Russia should force all political parties to guarantee there will not be further cuts in defence spending. Mr Stewart told BBC Radio 4’s The World At One: ‘I think there is always the risk of that, but equally there is the risk that if you do nothing, you end up with violence. They have all gone bonkers. This violence is directly due to things the EU did to Russia. ‘I mean this is the razor edge which Western policy makers need to walk. If they do nothing, Putin who is a real opportunist, will be encouraged to push his luck and see if he can humiliate Nato. If on the other hand we do too much, we could risk provoking an overreaction. 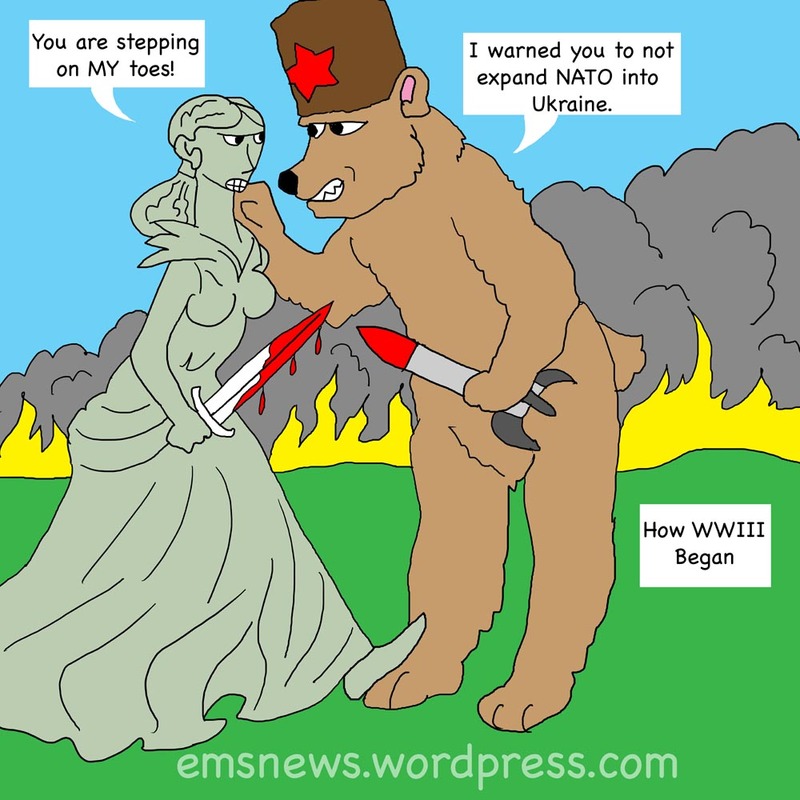 Putin humiliates NATO by telling them to stop overthrowing democratic governments! The shame! He said it was ‘very important’ to send a clear message to Mr Putin that Nato is ‘actually serious about defending its own territory’. This is EXACTLY how WWI began. 100 bloody years ago, the same stupidity, the same rulers, the same forces at work. The same idea one can fight all over the planet while running a massive empire and nothing bad would come of it and of course, ‘Let’s invade Russia’ was key to the entire mess as was WWII. Note that no government in the EU or US will hire anyone who understands anything about history especially the most obvious lessons. They not only won’t hire people with brains, they actively attack and silence pests who warn them about obvious dangers. The UK has been flying spy missions over and into Russian airspace for decades. The US the same. So Pot, kettle and the Colour Black. Trouble is that we have started believing our own propaganda. It is a Big mistake. Ever since and including Thatcher, the so called ‘special relationship’ is that between the rimmer and the rimmed. The UK being the one with the brown tongue. Wonderfully expressive cartoon again, Elaine. The US “Madam” of War with her bloody sword really nails the petty, carnal and crude games of dominance by the “AngloZionist” elites. I disagree that the ‘special relationship’ is one between “the rimmer and the rimmed”. The UK is simply the platform for the London City these days and not much more – and the London City is joined at the hip with Wall Street. These financial power centers are a huge part of the core machine of the AngloZionist elites (to use the Saker’s very accurate term), the others being the US military machine and the US, UK and Israeli intelligence services. It is interesting that Germany is now sending out signals that they cannot stop Canada and the US from sending more arms to Ukraine. Germany is clearly getting concerned about the escalation of the war in Ukraine. I love the cartoon. It sums up the relationship so perfectly. All the US and NATO mercenaries and all the military equipment stamped ‘USA’ found in Debaltsevo after the battle, and the English language news is all shouting about a “massive Russian assault” … I’d find it funnier if I were living on another planet. Imho, the Democrat Party made its final sellout to the elites when Billy Boy Clinton was in the White House. Clinton and the Dem. National Committee decided during this time to chase after the same rich donors as the Repugs do. Yes, the sellout to corporate interests went on before Clinton, but, imho, the last vestiges of concern for their traditional voting base from Democratic leadership went down in flames under Bill Clinton. Spot on analysis as usual, Elaine. Especially the part about the hiding of the Jewish bankster actions in Germany, that gave Hitler his excuse to round up all the non-bankster Jews. Petruchio, Clinton was apparently a CFR/trilateral puppet long before he was President. So his sellout to the Pharisees was planned all along. These people are the enemy. The Rise and Rise of Rory Stewart. Roderick ‘Rory’ James Nugent Stewart, OBE, MP, FRSL (born 3 January 1973) is a British academic, author, diplomat, and Conservative politician and chair of the Defence Select Committee. Since May 2010, he has been the Member of Parliament for Penrith and The Border, in the county of Cumbria, North West England. Stewart attended the exclusive Bilderberg Conference in June 2011, along with leading world politicians and bankers including UK Conservative Chancellor George Osborne. Columnist Charlie Skelton commented in the Guardian that this made it likely that Stewart would receive a “forthcoming promotion”, based on the history of other politicians invited to the exclusive Bilderberg group. Stewart won the election for Chairman of the House of Commons Defence Select Committee on 14 May 2014 following a vote of all MPs. Yes, in England there is overt Bilderberg news. Here in the US it is totally forbidden. Want to be banned at any major US news site? Use the word ‘Bilderberg’ and you are banned for life! No joke. Seriously. It is part of their filter system to insure no one ever mentions this group. ‘Many years ago before zionists bought and took over and destroyed the atlantic monthly, i read it. 12 years ago, they even had an open website and i was allowed to run a section of it, examining politics. until…i wrote the fatal five letter word when that year, zionists infiltrated the place and began censoring people. naturally, i was instantly banished. as i was, at the same time, banished from the democratic underground where i cross-posted stuff. Putin was trained as a lawyer. His logic is impeccable. Would that we have his level of intelligence and articulation in the West. Instead we have Macron, Merkel, Trudeau, May, Pelosi, Schumer et al. not an honest bone among them. Poseurs and traitors, every one of them.